And why is it so vitally important? The US is set to become the only country not signed up to the Paris Agreement, after Syria said it was planning to join the deal. The US said in June that it was intending to withdraw from the deal - however the rules of the agreement mean it won't be able to do so until 2020. Syria announced its plan to sign the agreement at the current COP23 climate change talks in Bonn, Germany. "I would like to affirm the Syrian Arab Republic's commitment to the Paris climate change accord," said Syrian Deputy Environment Minister Wadah Katmawi. The announcement is seen as largely symbolic, given the challenges faced by the war-torn country. Climate change is one of the biggest challenges facing the world today. It is responsible for the increase in extreme weather events, as well as an unbroken series of hottest years on record. Indeed, environmental concerns and the threat posed by climate change have been a consistent feature of the World Economic Global Risks Report for the last decade. In recognition of this, 179 countries and the EU spent two weeks in Paris during December 2015 hammering out the final wording of an agreement to keep global temperature increase well below 2C and if possible, below 1.5C. The reduction in temperature can only be achieved through a significant reduction in the emission of greenhouse gases. Known as COP21, (The 21st Conference of the Parties to the UN Framework Convention on Climate Change), it was one of the largest gatherings of world leaders ever seen. Everyone who attended COP21 made emission-cutting pledges. These are known as “intended nationally determined contributions”, or INDCs for short. At the time, the US pledged to cut U.S. climate pollution by 26-28% from 2005 levels. China’s target is to reach peak CO2 emissions by 2030 at the latest, lower the carbon intensity of GDP by 60% to 65% below 2005 levels by 2030, and to increase the share of non-fossil energy carriers of the total primary energy supply to around 20%. The EU plans to cut emissions by 40% by 2030 on 1990 levels. 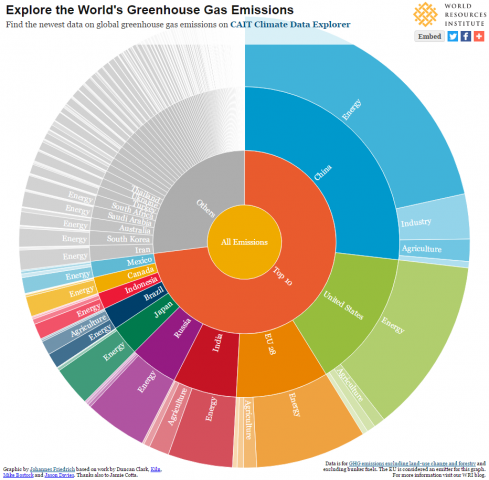 The Paris Agreement came into effect on November 4th 2016, after the minimum threshold was met - 55 countries representing at least 55% of global emissions. For countries that join after this point, the Agreement comes into force 30 days after the country "deposits its instrument of ratification, acceptance, approval or accession with the Secretary-General." The COP23 meeting in Bonn hopes to create a road map towards achieving the goals of the Agreement and combat global warming. What happens if a party changes its mind? The United States announced in June that it intended to withdraw from the Paris Agreement. However, once a party has joined the agreement, they cannot begin the process of withdrawal for three years. There is no financial penalty for leaving, but with Syria's announcement it will leave the US as the only nation not party to the agreement. The Paris Agreement signifies years of work in trying to combat climate change. In 1992, countries joined an international treaty, the United Nations Framework Convention on Climate Change. In 2005, the Kyoto Protocol became a legally binding treaty. It committed its parties to internationally binding emission reduction targets. It ends in 2020, and COP21 is designed to take its place.